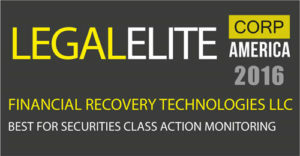 MEDFORD, MA, October 26, 2016 — Financial Recovery Technologies is the Best in Securities Class Action Monitoring in the Corporate America 2016 Legal Elite Awards. These awards recognize the skill and dedication of firms, teams and individuals that help and support the legal process, with a focus on the results that come from commitment and passion in the industry. Since 2008, FRT has been an innovator and pioneer in using technology to insure institutional investors maximize their recoveries resulting from securities litigation, while at the same time improving the level of transparency and governance for these investors over this somewhat opaque process. Through a combination of proprietary software, deep subject matter expertise and a commitment to client service, FRT has become an industry leader as is recognized today by Corporate America Legal Elite.